From the Ozarks to Independence, and across the state, Missouri has a number of rocks and minerals that can be found in crystal form. While iron, lead, copper and zinc are prevalent, you can find crystals in public mines or in nature. In some areas, you might need good hiking shoes, a little hammer, pick-axe, shovel or other tools to find what you are looking for. Or you may discover geodes right along a river bank. If you have a keen eye, you may be permitted to dig through the fallout from rock digging sites, too. No mention of rocks found in Missouri ought to omit Mozarkite--the state gemstone. Though colors vary from reds and blue to yellow or green, Mozarkite is a chert with bands and swirls, like jasper. 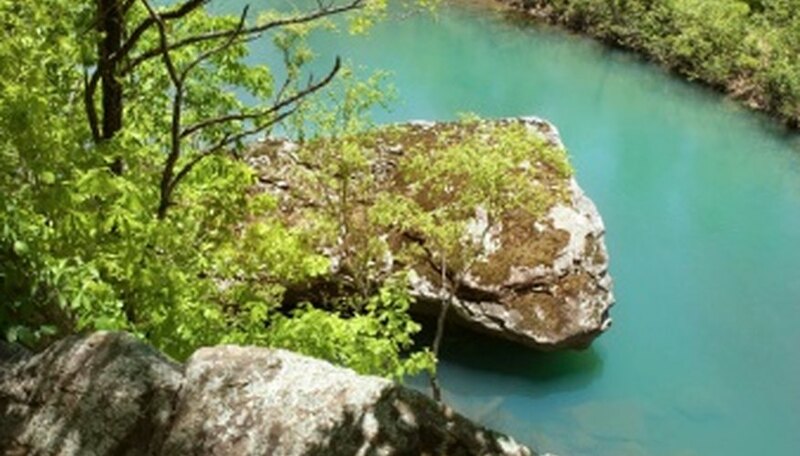 It's name derives from the Missouri/Ozark connection. This rock is a silica quartz in the cryptocrystalline family, and is similar to jasper. Where you find it, you may also find a variety of other crystals and stones. Galena is prevalent across the state, too. It's the mineral form of lead sulfide, appearing as shiny, metallic cubic crystals. Quartz crystals are beautiful to find, in myriad forms. Druse is quartz found growing on other types of rock. Usually, they are tiny quartz crystals on the surfaces of the other stones, and often they are in sparkling groups that cover large sections. Malachite, pyrite, hematite and chrysocolla can be found in this form in Missouri. Identification is tricky, but if you bring along a basic rock-id booklet, you'll be able to differentiate the rocks. Alternately, people who operate mines or quarries might assist you. Rivers and streams around the state can yield geode finds. These are usually round stones with a rough outer surface, but when broken or cut open, reveal crystals inside. Typically quartz or members of the quartz family, finding these can be a real delight to the rock hunter. Look around St. Francisville. Many of them can be found in the northeastern part of the state. You may chance upon small geode pieces or huge oval ones in fields or farms where tractors and other machinery have dug the ground. Many other crystals can be found throughout the state, including barite, calcite, limonite, dolomite, feldspars, gypsum and sphalerite. A number of mines listed on various state geology sites list anglesite, bornite, covellite, chalcocite, chalcopyrite, cuprite, linnaeite and limonite as well. Sometimes these rocks, minerals and crystals can be found together in the same location. The Talking Rocks Cavern in Branson has an area where visitors can mine for crystals. Some gemstones you'll find are garnet, quartz and amethyst. There was a time you could see beautiful crystal formations of scalenohedral and barrel calcite at the Crystal Cave in Joplin. Sadly, the cave was shut down to public visits and filled in so the crystals are buried.